Booze and ice cream. Two of humanity’s greatest inventions, so why not combine them? As I discovered on a weekend trip to San Antonio recently, you can, and it’s magical. And while boozy ice cream is typically made with gelatin, if you’re willing to put in a little extra leg work, yours can be 100% vegetarian. It’s Friday afternoon, you’ve made it through the long week, and it’s time for Happy Hour, Gizmodo’s weekly booze, etc. column. A cocktail shaker full of innovation, science, and alcohol. Let’s get ice cream wasted. I had heard tell of alcoholic ice cream before this summer, but conceptual awareness did not prepare me for the flavor explosion I ordered on a hot summer’s evening at “The House,” an unassuming, family-owned ice cream parlor in San Antonio’s Southtown district. A simple scoop of coffee, kicked five notches up with a healthy splash of Patron XO Café. Shock. Wonder. Awe. This was a borderline religious experience. I returned the following afternoon to speak with co-owner Rob Nickle about booze, ice cream, and how the laws of physics can be bent to combine the two into a summer treat that makes your childhood ice cream parties look like a cruel joke. Lum and Addison are geniuses who deserve Nobel prizes for their groundbreaking work. Still, gelatin ain’t for everybody. For one, gelatin is not vegetarian. Two, as Nickle points out, packing jello shots into ice cream can make the texture kinda funky. Early on, when he started exploring boozy ice cream last fall, Nickle decided that, hell or high water, he’d skip the gelatin. And he’s done a remarkable job of it. By keeping all of his ingredients (alcohol included) well-chilled, and cranking the freezer down to -10ºF, Nickle is able to work about 30 oz of 30 — 40 proof booze into a 2-gallon tub of ice cream, which works out to a bit less than a shot per scoop. And this is pushing the physical limits of the universe. The House’s ice cream is on the soft serve side, and as you’d expect, the boozier flavors tend to melt fast. But Nickle sees this as a fun challenge. The House has five rotating alcoholic ice cream flavors on tap at any point, ranging from a tropically delightful Blue Curaçao to a spicy Aztec Chocolate Amaretto. And if the ice cream isn’t punchy enough for your taste, you can always order an extra shot on top. 1. Heat 1 c cream to simmer in a saucepan, whisk in cocoa powder. Remove from heat, stir in chocolate until well incorporated. 2. Place mixture in a metal bowl inside a larger bowl filled with ice water. Slowly whisk in the remaining cup of cream. Place a mesh sieve over the bowl. 3. Simmer 1 c milk, the sugar, salt, cinnamon and cayenne over low heat in a saucepan, whisking to incorporate the spices and dissolve the sugar. Whisk egg yolks together in a medium-sized bowl. Slowly pour heated milk mixture into egg yolks, whisking constantly. Use a rubber spatula to scrape the warm mixture back into the saucepan. 4. Stir the milk and egg mixture constantly over low heat, scraping the bottom as your stir, until the mixture thickens. Continue to stir until the mixture can coat the back of a spoon, and running a finger across the spoon won’t cause the coating to run. This should take 3-5 minutes. 5. Once milk egg mixture is thick, remove from heat and immediately pour it over the mesh sieve, into the bowl with the chocolate cream. Stir to combine and set the mixture in the fridge until completely chilled, at least two hours. 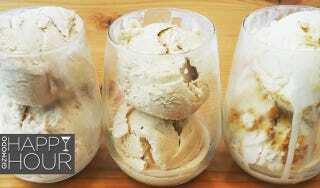 Before you churn the mixture in an ice cream maker, it’s time to whisk in the booze! Mix as much chilled amaretto as you dare into your custard, bearing in mind that the more you add, the harder it’ll be to freeze and the softer your final ice cream product. Author’s note: As I learned the hard way, it’s a very good idea to start with a small amount of booze and work your way up incrementally. I started with 4 oz of amaretto, whisking it into the chilled custard before pouring into my old fashioned, crank-operated ice cream maker. After about 20 minutes of laborious churning, the mixture started to get slushy. Success?! Sort of. At that point, I decided to throw caution to the wind, adding another four full ounces of booze. This set my ice cream back quite a ways. After a looot more churning, I was back at frozen daiquiri consistency and pretty exhausted. I decided to throw the ice cream bucket, slushy and all, in the freezer overnight. The experiment, 12 hours on. I think I need a colder freezer. I learned a lot from my ‘experiment’, and I’ll definitely be attempting this again — perhaps with a liiiitle bit more discipline regarding the addition of alcohol. But I encourage you to get creative. Try the recipe above, or make up your own, and let us know how it is! Making boozy ice cream — especially if you decide to forgo gelatin — is a challenge, but the rewards are well worth it. If successful, you will rise to deity status in the eyes of your friends. If not? Welp, you can always drink your ice cream soup on the rocks. You can check out The House on Facebook and Instagram, or pay ‘em a visit!